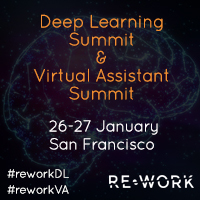 Join experts in AI, deep learning, conversational agents and machine learning at the annual Deep Learning Summit and Virtual Assistant Summit in San Francisco on January 26-27. Companies sharing their latest technical advancements and applications at the summit will include: Google, Facebook, x.ai, OpenAI and Uber. Tickets are now limited. Book your place here to join 500+ industry leaders, world leading researchers and innovative new startups at the event! Can Convolutional Neural Networks Crack Sudoku Puzzles? Are you passionate about the future of data analytics and desire to help shape it? If so, Comcast is looking for a Data Scientist with deep quantitative and statistical skills to join a Data Science team which consists of world class business minds and scientists tasked with driving transformational change through evidence-based decision making.